We continue to unpack boxes from the years 2007, 2008, and 2009, stored for the last five years in our basement. 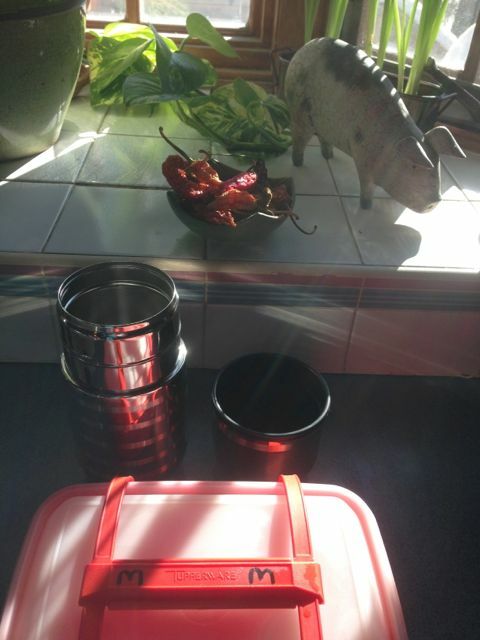 Items like this tupperware container and travel-mug are easy to integrate into the now. These items are practical and hold no trauma triggers from the past. Upon unpacking this kind of stuff, I can easily see where it fits into my current life and by the end of the organizing session, it is brought to the location in the home where it belongs. After a quick cleaning it finds its place among the living. In direct contrast, the weighty stuff waits at the bottom (25% of basement shelving previously weighed down by 2007-2009 boxes remains occupied, with good reason). Bags and boxes marked with the label “trauma” mean that I’ve opened the box and upon first glance, have found a mess of mixed items that bring me back body, mind, and soul to the vivid moments of my life-at-that-time in crisis. When looking at the mixed materials (papers, business cards, home decor), my body feels a similar sense of anxiety and uncertainty as I experienced seven years ago when I was called to become a full-time FTD caregiver and fell-off-the-cliff (of the professional and supportive social context I enjoyed at the time). Considering the time it takes me to process these types of boxes, I’ve decided to put the processing on hold for another time in the future when I can focus solely on these types of boxes as their own special project. 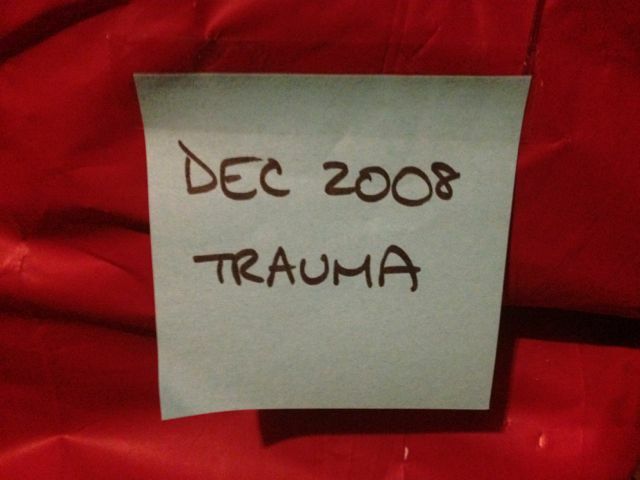 Right now there are a total of 22 “trauma” and “mary’s life” boxes that are staying in consolidated storage. These represent about 25% of the total 2007, 2008, 2009 boxes that have been stored in the basement for five years. By waiting to deal with these difficult boxes, we are able to cruise through the purging and re-assigning of easy-to-integrate items (75% of the total targeted content). Our next step as far as the basement clean-out goes is to float and integrate upstairs as much as possible from the boxes unpacked. Floating (easy-to-integrate or donate) contents include: donations, music, books, bath, kitchen, dining/entertaining, art supplies, office supplies, clothing, home decor, antiques, dolls, and art.